A recent study conducted by the University of Exeter and the University of Western Australia has found that wild magpies living in larger groups are more intelligent than magpies living in smaller groups. The study also found smarter female magpies had greater reproductive success. The research suggests that the demands of living in complex social groups may play a role in the evolution of intelligence. What is the Australian magpie? The Australian magpie (Gymnorhina tibicen) is a medium-sized black and white bird native to Australia and southern New Guinea. There are nine recognised supspecies, and the adult Australian magpie is a pretty robust bird ranging from 37 to 43 cm in length, with striking black and white plumage, brown eyes and a solid wedge-shaped bluish-white and black bill. Although the male and female are similar in appearance, they can be distinguished by differences in back markings. While the male possesses pure white feathers on the back of the head, the female has white blending to grey feathers on the back of the head. The Australian magpie has rather long legs, and consequently walks instead of waddling or hopping. The UWA researchers, lead by Dr Ben Ashton, Dr Amanda Ridley and Dr Alex Thornton, examined the cognitive performance of 14 wild groups of Australian magpies (Western Australian subspecies Cracticus tibicen dorsalis) in Perth, ranging in size from three to 12 birds. The birds were tested away from other birds to prevent social factors influencing the results. 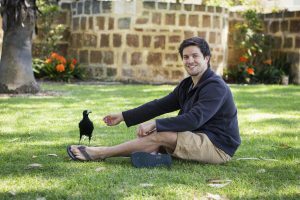 The cognitive ability of each magpie was tested via four different cognitive tasks that tested inhibitory control, reversal learning, associative learning, and spatial memory. These tasks included a detour-reaching task, which involved the birds having to find food hidden in a transparent cylinder. Two foraging tasks tested associative learning by hiding food in different coloured containers. Finally, a memory task involved a food reward being hidden in the same place many times. “The challenges of living in complex social groups have long been seen as drivers of cognitive evolution, however evidence to support this is contentious, and has recently been called into question,” Dr Ashton said. According to Dr Ashton, it’s possible that differences in energy intake and task attention could also affect cognitive performance. Therefore, body weight, foraging efficiency and reluctance to engage in the task were also taken into account in the study. “They also suggest a positive relationship between female cognitive performance and reproductive success indicating there is the potential for natural selection to act on cognition. This is one of the first studies to conduct large-scale cognitive tests on wild populations and find a strong link between cognition, group size and reproductive success.